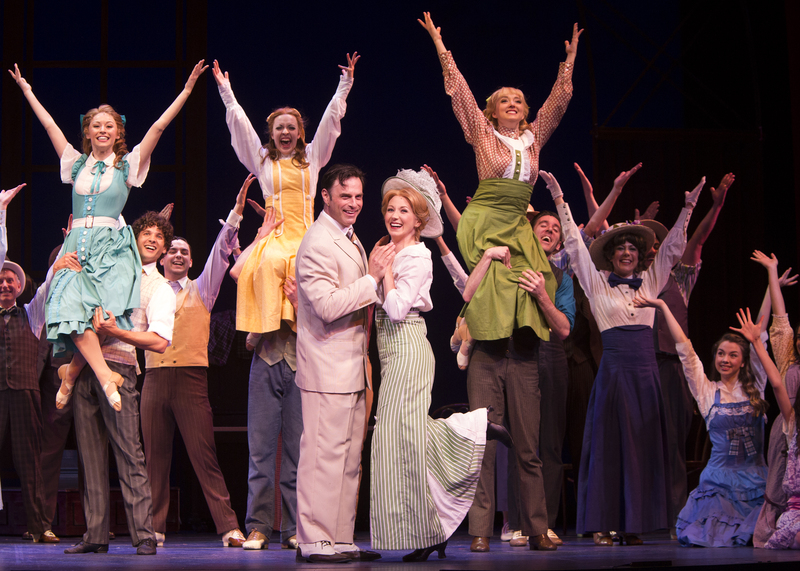 Anthony Crane as Harold Hill and Sara Jean Ford as Marian Paroo with cast. Photo by Bruce Bennett, courtesy of Theatre Under The Stars. Like the seasons of the year, there are some things in life that just seem to keep returning with a certain regularity. 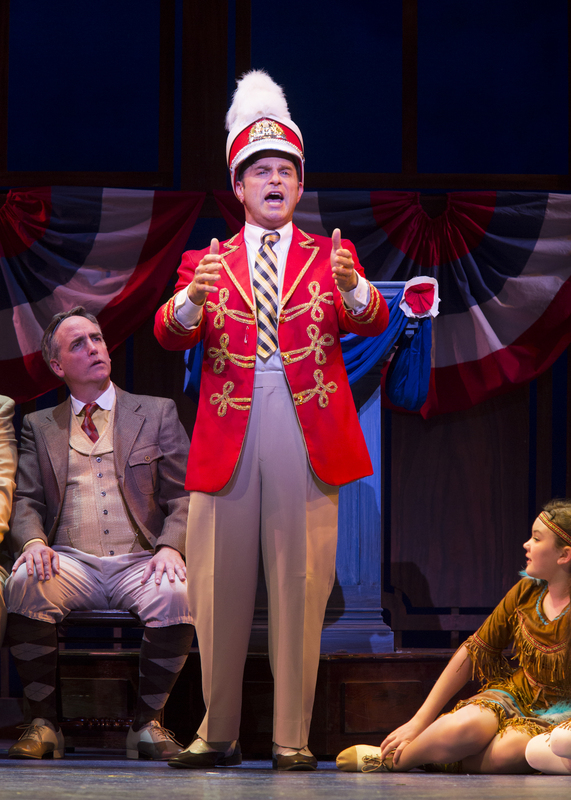 Thankfully, Meredith Willson’s brilliant musical, The Music Man, is a case in point. It would be rare for a couple of years to go by without a production of the show popping up somewhere nearby, and for a current example we have the very wonderful edition now being presented at Houston’s Hobby Center. 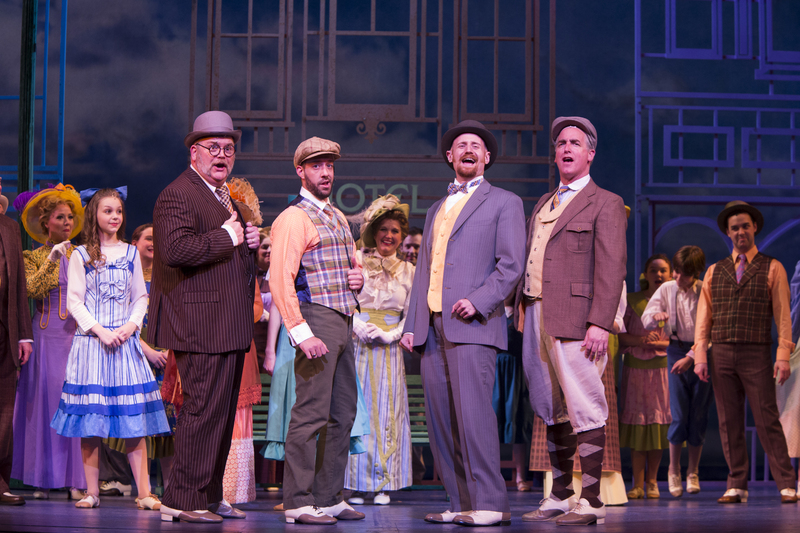 Splendidly directed by Bruce Lumpkin, it beautifully captures the small town warmth and humor of the piece, while beautifully wrapping it all in the countless delights of Willson’s rich and varied musical score. (Musical Director, Jeff Rizzo, quickly showed his skill conducting the lush and lovely Overture). Anthony Crane as Harold Hill. Photo by Bruce Bennett, courtesy of Theatre Under The Stars. 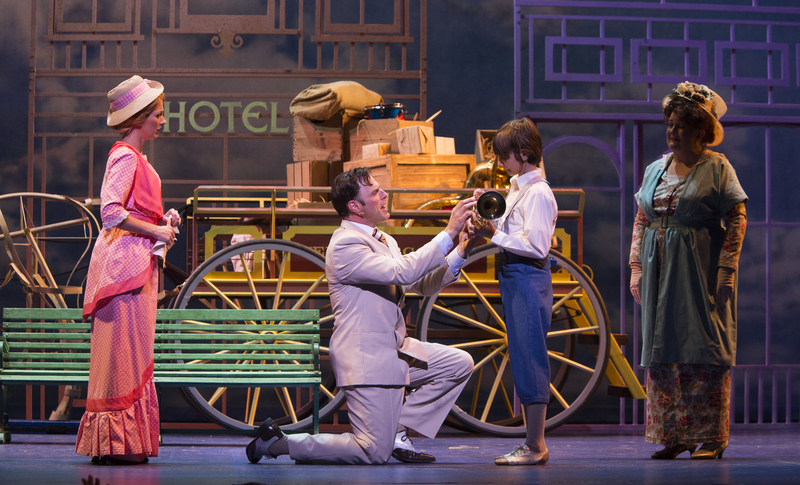 The simple yet creative scenic designs of Martin Christoffel seem to outline this cheerful world, while the colorful costumes of Colleen Grady combine with the bright lighting designs of Richard Winkler to produce the warm and inviting hometown atmosphere of River City, Iowa in 1912. For many of us, it’s a place we would love to be, even if just for these two delightful hours. The lighthearted plot, (familiar to many from the classic film starring Robert Preston in the title role), brings us the misadventures of traveling salesman and notorious con artist, Harold Hill, played here with high energy and comic flair, by J. Anthony Crane. Hill arrives in town by train during the highly unusual opening number, “Rock Island,” which neatly captures the locomotive tempo via a carload of singing traveling salesmen. Anthony Crane as Harold Hill and Ensemble students from TUTS’ Humphreys School of Musical Theatre. Photo by Bruce Bennett, courtesy of Theatre Under The Stars. One of their number, salesman Charlie Cowell, alerts the others to rumors of a notorious salesman calling himself Professor Harold Hill, and giving local salesmen a bad reputation with his unethical sales methods. Peter Chursin as Tommy Djilas with Ensemble students from TUTS’ Humphreys School of Musical Theatre. Photo by Bruce Bennett, courtesy of Theatre Under The Stars. Dink O’Neal brings bombastic fun to the role of Cowell. It is not long before Harold is circulating in River City to convince the townsfolk of their need for a boys marching band, with the ultimate goal of selling them band uniforms and instruments before skipping town himself without teaching anyone a single note of music. Complicating matters is Harold’s encounter with the town’s young music teacher and librarian, Marian Paroo (Played here by the lovely and silken-voiced, Sara Jane Ford). Mrs. Paroo, Marian’s feisty Irish mother, is eager to get her daughter married and is delightfully played by Mary Vanarsdel. Sara Jean Ford as Marian Paroo, J. Anthony Crane as Harold Hill, Christopher Wolff as Winthrop Paroo and Mary VanArsdel as Mrs. Paroo. Photo by Bruce Bennett, courtesy of Theatre Under The Stars..
Kristen Paulicelli as Zaneeta Shinn and Ensemble Ladies. Photo by Bruce Bennett, courtesy of Theatre Under The Stars. The ensemble chorus that supports such showstoppers could not be better, and that was evident right from the tongue-in-cheek fun of the townspeople singing the opening song, “Iowa Stubborn.” Throughout the show the whirling and eye-popping choreography is beautifully executed in one number after another by this very talented cast. (Choreographer, Michelle Gaudette). THE SCHOOL BOARD: Thom Culcasi as Ewart Dunlop, Charles Swan as Oliver Hix, Joseph Torello as Olin Britt and Phil Gold as Jacey Squires. Photo by Bruce Bennett, courtesy of Theatre Under The Stars. The musical is full of delightful characters such as the four clashing gents on the local School Board. With Harold’s wily help, they find unity by forming a very mellow barber shop quartet that offers terrific renditions of “Goodnight Ladies,” and “Lida Rose.” That latter number was joined in such exquisite counterpoint with Marian’s, “Will I Ever Tell You?” that it must be considered a musical highlight of the production. And speaking of Marian, Professor Hill serenades her in the library with a somewhat whiny, “Marian the Librarian,” that is far from a musical highlight of the show, but evolves into some of the best choreography as the youngsters in the library come slowly to life from reading their books to looking like a lively dance scene from West Side Story. 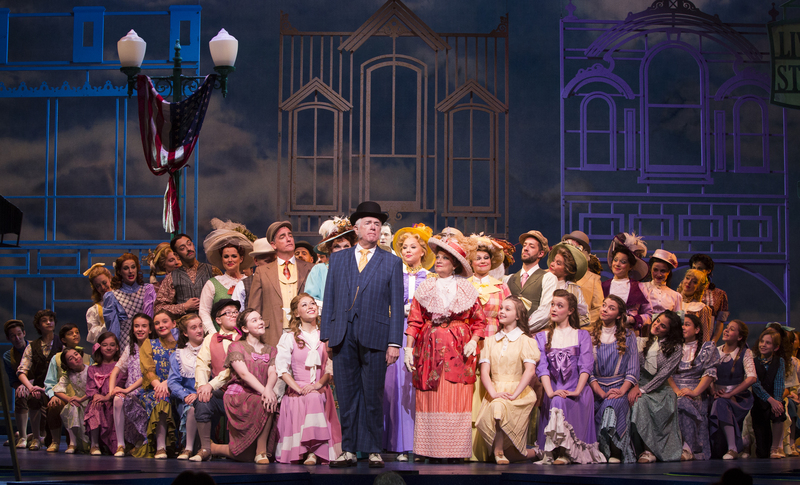 Kevin Cooney as Mayor George Shinn and Chesley Ann Santoro as Eulalie Shinn with full cast. Photo by Bruce Bennett, courtesy of Theatre Under The Stars. For comic relief we have the hilarity of the town’s blustering Mayor Shinn (Kevin Cooney), his nutty wife, Eulalie (Chesley Ann Santoro), and her band of Pickalittle Ladies preparing a very amateur theatrical for the town’s 4th of July festivities. 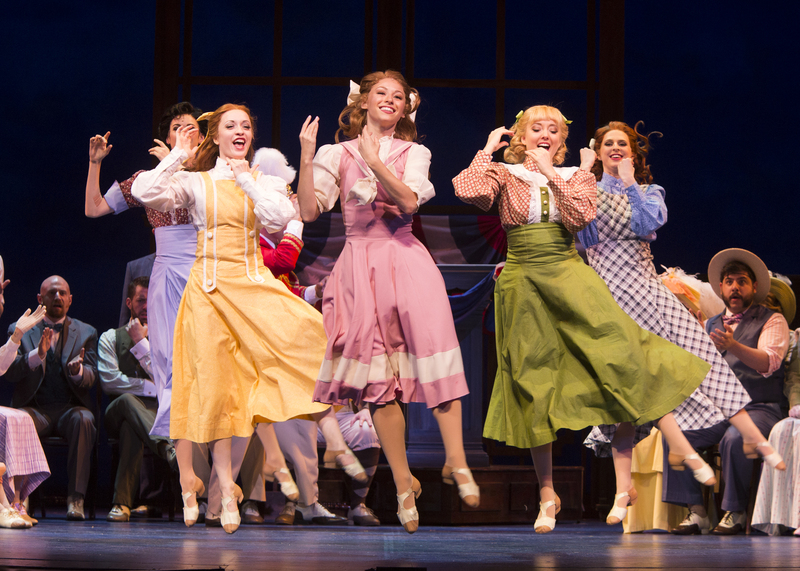 Chesley Ann Santoro as Eulalie Shinn, Liz Curtin as Alma Hix, Sara Jean Ford as Marian Paroo Ensemble. Photo by Bruce Bennett, courtesy of Theatre Under The Stars. Their gossiping song, “Pickalittle,” is a tongue twisting treasure. For youthful romance we have the Shinn’s teenage daughter, Zanetta (pretty Kristen Paulicelli) and her crush on handsome town rowdy, Tommy Djilas, played here by very talented dancer, Peter Chursin. 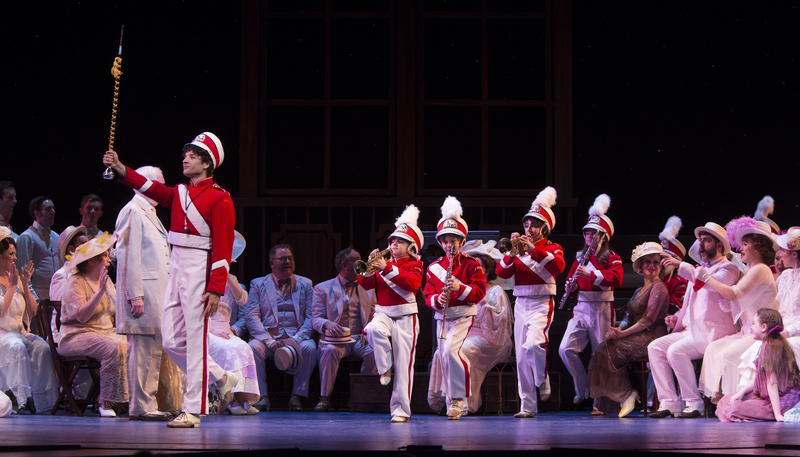 The fun never really stops, and Act II has been said to be even more delightful than Act I. But any way you slice it, this 1957 Tony Award winner for Best Musical, deserves its place as an American musical theatre classic. Don’t make the mistake of those who might think of it as a corny piece of Americana. It is so very much more! 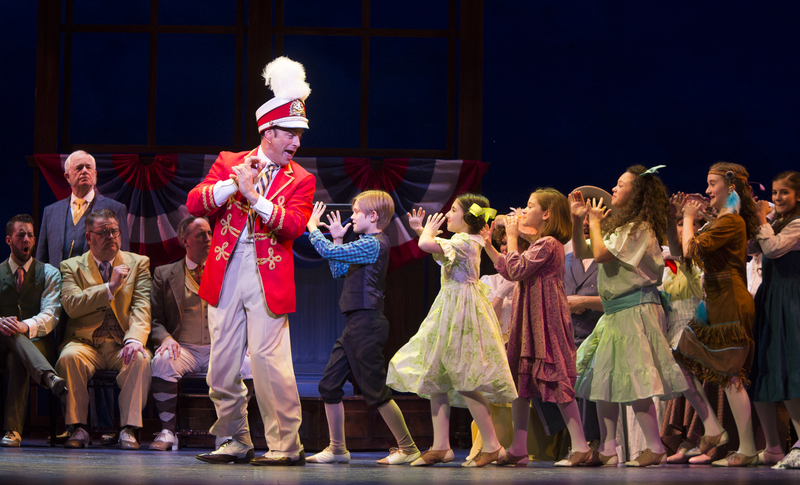 THE MUSIC MAN continues through May 17th at Houston’s Hobby Center main stage with performances on Thursday at 7:30 pm, Friday and Saturday evenings at 8pm, Saturday and Sunday matinees at 2pm, and a final performance next Sunday evening at 7:30 pm. For tickets visit the website at www.TUTS.com, or call (713) 558-8887 locally and (888) 558-3882 (outside of Houston). This entry was posted in Broadway, BroadwayStars.com, Conroe Courier, HERE HOUSTON-Lifestyle & Entertainment, HereHouston.com, Houston Community Newspapers online, Houston's Hobby Center, Meredith Willson, The Music Man, The Villager Columns, ThePeoplesCritic.com and tagged Broadway, Meredith Willson, The Music Man, Theatre Under the Stars. Bookmark the permalink. One of the greatest gifts you bring to the endeavor, Dow– is something these young players may put into their portfolios. Not to say it’s always charming, but those who read your copy know that you tell it the way you see it. And it’s clear you’ve been around the block. Were I one of their number, and to have a positive line or two from TPC, I’d sleep happily knowing that I did my job! From here in New York I send you my sincere thanks for your kind words regarding my work. Perhaps one day we can meet in person and I can thank you for your service to the Mayflower Society. God Bless You in all future endeavors. Great review, how can I post to Facebook? You might also want to include the basic website ( http://www.ThePeoplesCritic.com ) which includes an archive of many hundreds of my reviews. If you happen to be in NY this evening, you should stop by. 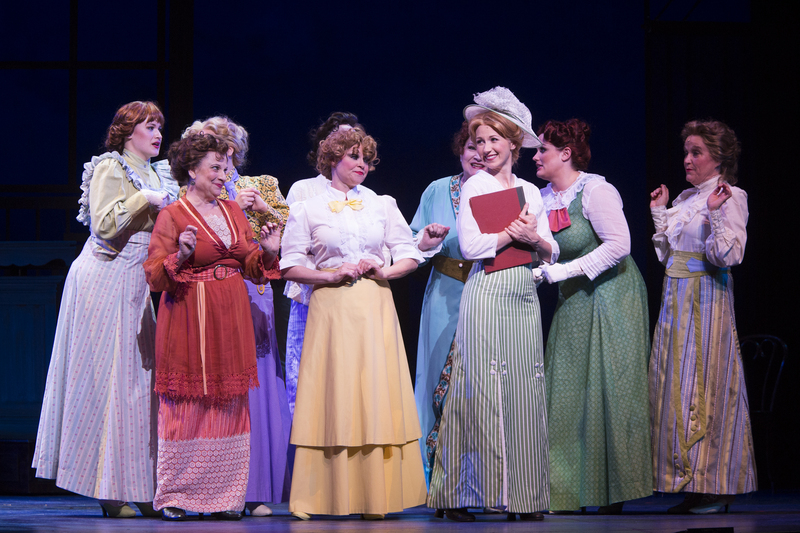 They are all Houston performers, you Chris Wolff already in Music Man.